About Barbara Segal Barbara Segal enjoyed an early childhood of suburban privilege–1950’s style. But, in 1963, her life changed; her father had died. Memories of that lost childhood are preserved in powerful personal images that continue to resonate in Segal’s work today. (Series: Little Girls’ Dresses) In 1972, while a student at Pratt Institute, NY, Segal resolved to spend both her junior and senior years at the distinguished École Nationale Supérieure des Beaux-Arts (ENSB-A), Paris, to study stone carving with teachers like René Collamarini with whom she later exhibited at the Musée Rodin. Segal then moved to Italy where she spent time over the next four years in both Pietrasanta and Carrara working at the Studio Sem, the Fonderia Luigi Tommasi and SGF Studio Scultura alongside great artists and artisans, like, Jacques Lipshitz, Agustín Cárdenas, Bruno Luchessi, Max Bill, Julio Silva, Isamu Noguchi, Paolo Grassi and Mario Fuendi. Europe’s rich culture and ubiquitous art percolated and fermented within Segal. But, evidence in Segal’s body of work suggests that her eyes lingered just a bit longer on both Renaissance and Baroque art. The forms, patterns, and textures that permeate her work confirm that Italy’s architectural masterpieces, both the imposing exteriors and their tantalizing, lush interiors held sway over her imagination. (Series: Shirts and The Apron) Segal returned to New York City in the late-70s knowing she could create whatever she chose in stone. America’s evolving culture with its pop and fashion icons would prove a continuing source of inspiration. However, to this day, what Segal chooses to create is personal; her creations provide insight into her passions, struggles and quirky wit. Segal enjoyed early success in her career with solo exhibits at both museums and private galleries. Eventually, her focus expanded to the public art arena. This was in response to Segal’s long-held belief that sculpture could be used as a tool to promote community involvement, pride and well-being. Segal’s public works reflect a shift from aesthetic detail to grander scale abstractions of nature’s rhythms and flows. However, no matter the scale, the essence of Segal’s work remains constant: the hard is rendered seductively soft; the ephemeral, permanent. In 1995, Segal founded Art on Main Street (AOMSY), a non-profit organization whose mission was to bring art and culture to downtown Yonkers to spur community and economic development. Among the lasting contributions of this organization was the role it played in the genesis of the Sculpture Meadow on the Hudson which was completed in 2003 as part of the Yonkers waterfront redevelopment initiative. Continuing her success in the realm of public art, Segal competed for and won, in 2001, a New York City Metropolitan Transit Authority (MTA) Arts for Transit commission. In 2004, the two 70 foot cast aluminum sculptures that comprise Muhheakantuck were installed on Metro North’s Yonkers station viaduct. In 2007, Segal and JMC Art Partners conceived and executed, along with a call for artists, the award winning Art Trucks project. Today, Segal’s attention has shifted back to the quarries of Italy, where emerging technology is meeting ancient tradition with powerful effect. Segal knows that her time to tackle new challenges is now and she once again draws inspiration from Italy, where she spends time working and exhibiting. Segal resides in Yonkers, NY with her husband and son where work progresses on private commissions and her latest series. Segal shows her work both nationally and internationally. 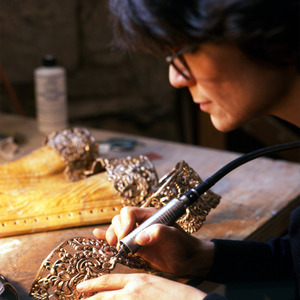 She is a contributor to internationally recognized publications and blogs about sculpture today. Segal teaches stone carving at the School of Visual Arts and foundations of sculpture at Westchester Community College.